What is better than laying by the pool and enjoying good food? Designing an outdoor kitchen during your pool building process can enhance the quality of your experiences in your backyard. 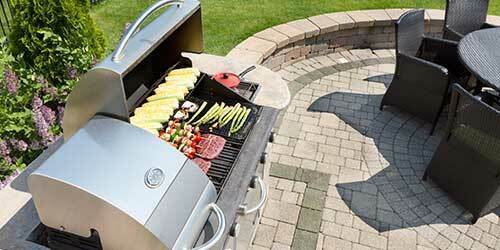 The convenience matter is what draws people into customized their own outdoor kitchen as well as the hosting aspect. You want to make sure you and your guests enjoy their time at your house. 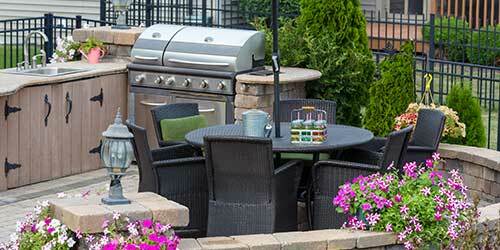 Outdoor kitchens are a vital piece in the overall value of your backyard oasis. The convenience factor of building an outdoor kitchen is one of the largest reasons for its appeal. It enhances your overall experience of the time spent in your backyard. You will never want to leave your home! This will not only increase space in your home, but it will also be beneficial for hosting. Contact Pools by Design today to work with our design team to create a beautiful outdoor kitchen. Two of the best things in life are good food and good company. Why not have both of them in your backyard? Here at Pools by Design, we can help you build out your dream backyard oasis. Nobody wants to have to continue to run in and outside of their home for food and cold beverages. You are letting out cool air, especially during the summer, there is a chance that you are tracking in mud or dirt, or your indoor kitchen supplies may not be meant for the outdoors. People also don’t want to leave food and beverages sitting out in the warm Tucson heat. 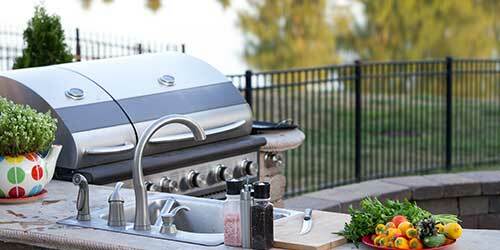 Building an outdoor kitchen is the middle ground to these issues. It is so convenient to be able to prepare, cook, and clean up food all without having to step foot into your house. You can have a grill, a fridge, an oven, or anything else you use to store and make your food. You are given the option here at Pools by Design to customize your outdoor kitchen however you like. You may not use a grill or you may not find use for an outdoor wine cellar. This is why it is a fun process to build an outdoor kitchen because there are endless possibilities. You can also design where you want the kitchen to be in your backyard, which directly affects aesthetic and convenience of it. We will collaborate together on which appliances you feel will be necessary as well as any other elements you need for cooking outdoors. If you utilize the fridge and pantry space outside, you will have more room inside! You can dedicate any of your outdoor kitchen supplies for your backyard abode and keep the products that are not meant to be outside in your indoor kitchen. This will also be beneficial from an organizational standpoint. You will not have to constantly sift through all of your kitchen supplies in order to find that one outdoor kitchen spatula you absolutely need. We can customize security measures on your outdoor kitchen, so you can be sure your outdoor cooking and kitchen supplies are just as safe as your indoor ones. 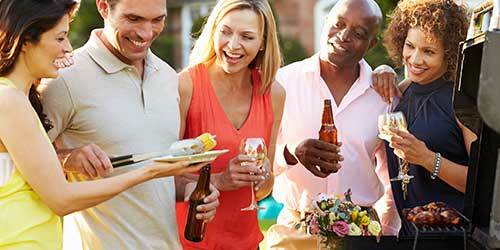 Outdoor kitchens provide ample amount of opportunity when it comes to hosting. You can customize your outdoor kitchen in accordance to the average amount of people that you host. If you know you have huge events often, you can customize several of patio tables and kitchen counter space for your guests. If you prefer a more secluded use of your pool and have smaller parties, than you can design your kitchen in a small space. Building an outdoor kitchen will be expensive at first, but the overall enhancement of your quality of life will soon outweigh the heavy dip it made into your pocket. If you want to be the house that everyone wants to be at, we highly suggest designing an outdoor kitchen alongside your pool.